The white spheres each contain a Cyberman. Jamie is caught spraying quick setting plastic into the X-Ray laser. He says the Doctor told him to protect the ship. An alert is declared and sidearms issued. The Cybermen report to their Planner that phase one, the launching of the Cybermats, is complete. Phase two, their undetected infiltration of the rocket, is also complete. It is now time to institute phase three. Zoe is concerned about the Hercules 208 star in the Messier 13 cluster. Bill assesses the damage to the laser and finds a small silver creature, which is found to have eaten the bernallium stocks that power the X-ray laser. The Cybermen are informed that a star has been ionised and meteorites will strike the Wheel. Seeking replacement bernallium in the stores Kemel is cornered by several of the creatures. He sprays plastic on one but the others kill him. Zoe examines it, and the Doctor suggests X-raying it revealing a Cybermat. Bill is put on report for failing to reveal the creature's existence. 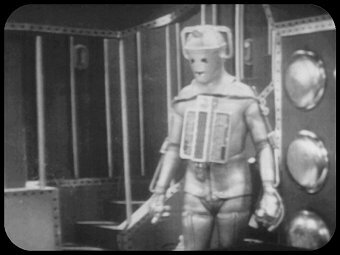 Two crewmen board the silver carrier and are brought under the Cybermen's hypnotic control and instructed to take them to the wheel where they will help the Cybermen. The Cybermen have had makeovers: They now have their chest units on the other way up (you can see the holes for the gun at the top now) and have lost the practice golf balls and vacuum cleaner tubes from their limbs replaced by stiff rods. Their fingers, previously pointed, now have flat stumpy ends. Their heads have been altered too: the eyes gain the now familiar tear drop with a similar design being added bellow the mouth. They gain a new electronic voice. They are now controlled by The Planner a collection of rods and tubes that uses the previous Cyberman voice. The Tenth Planet spacesuits are back for another appearance this episode. They're almost certainly in the previous episode too, but I can't be 100% certain as the telesnaps aren't clear. They're used throughout this story and then are put into storage until being used for the filming of the Star Wars cantina sequence during 1976. In April 1984 an anonymous letter was printed in Doctor Who magazine saying there was a missing Troughton episode, featuring the Cybermen & Cybermats, in the Portsmouth area. It had become known in fan circles that David Stead had acquired a copy of Wheel in Space 3 from a dealer. He'd been trying to return it to the BBC and had indeed already spoken with them but illness and other real life events had prevented him handing it over. Stead had already been persuaded to make a video copy of the film and that had then been copied and passed round fans. One person who had seen a copy was Gary Russell, then a write for Doctor Who magazine and now script editor on Doctor Who, who wrote the "anonymous" letter to spur Stead into returning it little knowing that he already was in the process of doing so. Wheel in Space episodes 3 & 6 appeared on video as part of Doctor Who: Cybermen the Early Years with The Moonbase 2 & 4 along with some extra material including an interview with Roy Skelton. The same episodes later all appear in Doctor Who - Lost In Time.